I love burgers. Growing up, whenever we would go out to eat, it was a pretty fair guess that my order would be a cheeseburger. A little ketchup, a little mustard, some yellow American cheese and nothing else. Perfection. Lucky for me, my tastes have grown up and expanded a great deal since then. That being said, though, I still enjoy a good burger every now and again (especially bison burgers, once I was introduced to them). So now when I’m craving a burger, I dress it up a little more. Just the other day I made the most delicious new burger combination. It takes a little extra work, but trust me, the results are worth the effort. 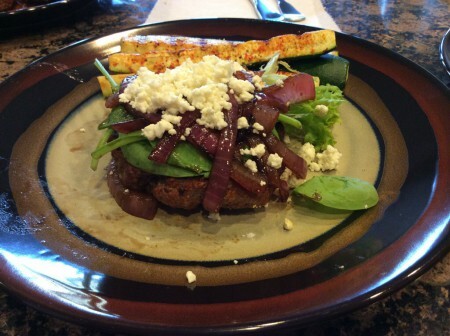 Really, how wrong can you go with a recipe with the name “Balsamic Onion-Smothered Burgers with Feta Cheese”? Not very far wrong, I don’t think. In fact, these burgers are so tasty and loaded with goodies they don’t even need buns, so they’re low carb, high protein and absolutely delicious. Sean was dubious at first, but after his first bite of burger, cheese and sweet-and-savory balsamic caramelized onions, he decided I’d hit pay dirt with this recipe. I hope you enjoy all the flavors of these burgers as much as I do! Combine ground round, ground sirloin, garlic, salt and pepper. Shape into six patties. Preheat the grill to medium-high heat. Spray with non-stick oil or olive oil before laying patties on grill once heated. (If cooking on the stove top, heat a grill pan or large non-stick skillet and cook the same way). Cook patties 4 – 5 minutes per side, covering in between, until done. Meanwhile, heat oil in a large skillet over medium heat. Add sliced onions and cook, stirring occasionally until tender. About 10 minutes. Stir in balsamic vinegar, and cook a minute or two more until vinegar evaporates. Top each patty with baby greens, onions, and feta cheese, and you’re done! With a side of grilled zucchini, these burgers really hit the spot. Tell me that doesn’t look delicious. 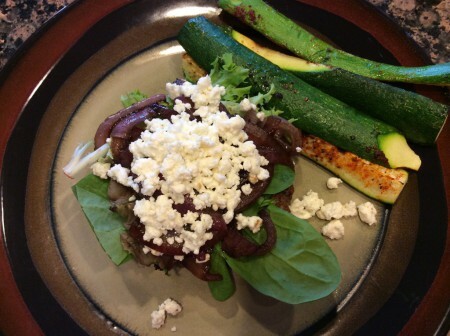 This entry was posted in Entrees, Recipes and tagged Balsamic Vinegar, Burger, Entrees, Goat Cheese, Hamburger, Low carb, Onion, Recipes on July 31, 2014 by Paige N..